It’s 2009, the year has changed, but the setting remains the same. 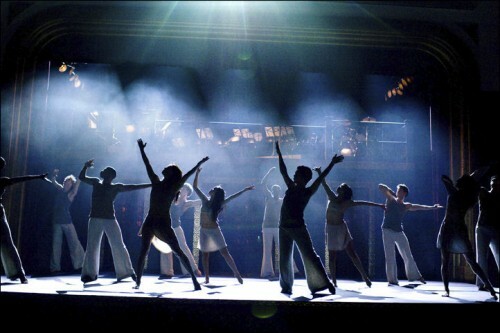 Based on the Oscar winning 1980 film, Fame chronicles the lives of young talented artists at the prestigious New York City High School of Performing Arts. We follow the students as they sing and dance their way through four years of high school while pursuing their dreams and dealing with the pressures of high school and everything that goes along with being a teenager, including academics, friendships, romance and self-discovery. So who are these talented young actors playing the role of a lifetime? Here’s a little bit about them. ASHER BOOK (Marco, singer) began his career at an early age onstage. He got his first break at an open casting call for the theatrical production of Beauty and the Beast as “Chip.” Most of Asher’s experience stems from several years in theater, film, and television. Theatrically, he played the principal role of “Oliver” in Oliver, and he was in the film Come Away Home, the original television movie Pop Rocks, and had guest-starring roles on Medium and Zoey 101. Asher currently performs as a member of the pop vocal group V Factory, which is gearing up to release its debut album on Warner Bros. Records next year. V Factory spent last May on a nationwide trek across the country for the first-ever “Bandemonium” tour. KRISTY FLORES (Rosie, dancer/actress) is from New York. She began taking ballet, jazz, tap, gymnastics and singing lessons early on in life, and has performed in Texas, at Walt Disney World, and in Las Vegas. In high school Kristy helped form her own dance group, Synergy, and was one of the choreographers, performing all different types of dance, from old school pop lockers and break dancing to fresh urban street jazz. She also joined a local break dancing crew called The Spiders. In high school she also started to write her own poetry and songs. She joined a program called the Vibe Theatre Experience, learning firsthand what teenage girls from different boroughs throughout New York were feeling, acting, dancing, reading poetry and monologues, and singing. Kristy joined The Bronx Dance Theatre and taught in local public schools. While working and teaching, she came across the chance to audition for Fame. NATURI NAUGHTON (Denise, pianist/singer) was born and raised in East Orange, New Jersey, and started singing in the choir at New Hope Baptist Church when she was just 5 years old. By the time Naturi was 14, her career shifted from local talent to professional recording artist. She became a member of girl band 3LW, and within six months the group had scored a record deal with Sony/Epic Records, eventually achieving a platinum selling album (1.3 million sold). While still a teenager, Naturi toured nationwide with Destiny’s Child, N’SYNC, and had the opportunity to work with such notable producers as P. Diddy and Full Force. 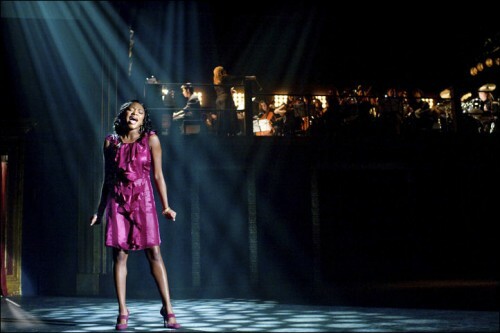 Just before her junior year of college, Naturi landed the role of “Little Inez” for the National Touring Company of Hairspray, which led to her Broadway debut in the same role in Hairspray in 2006. Naturi made her film debut in the feature film Notorious playing the role of Lil’ Kim. She is currently working on her own music for her solo project. PAUL IACONO (Neil, director) is a New Yorker through-and-through, and has performed in over fifty theatrical readings, workshops, and shows. Some of his favorites include Sail Away at Carnegie Hall, Mame at the Papermill Play House, John Guare’s Landscape of the Body, and the Drama Desk Award-winning revival of William Inge’s The Dark at the Top of the Stairs. Paul has appeared in several independent films, including Consent, Glow Ropes, Return to Sleepaway Camp, Winter Solstice, and Parrot Beach. On television, Paul can be heard as the voice of Benny the Bull on Nickelodeon’s Dora the Explorer. He played Billy Boy in the MTV sketch comedy show Human Giant, and has made appearances on the soap operas Guiding Light, As the World Turns, and Another World. Paul’s other passion is writing. His new play “Price/Elizabeth” recently received its first reading in Manhattan, featuring Taylor Momsen and Connor Paolo of Gossip Girl. PAUL McGILL (Kevin, dancer) grew up in Pittsburgh, PA, and is the youngest of two talented children. As a junior in high school, Paul was cast as an original cast member of the Broadway revival of La Cage aux Folles by Tony-nominated director and choreographer Jerry Zaks and Jerry Mitchell. Paul finished high school and was soon cast in the much acclaimed Broadway revival of A Chorus Line as the impressionable Mark. Paul also starred in the documentary Man on Wire as the title character Philippe Petit. KAY PANABAKER (Jenny, actress) is recognized by many from her role as angst-filled teen “Nikki Westerly” on the drama Summerland. Younger fans know her work on the Disney Channel, including the telefilm Read It and Weep and a recurring role on Phil of the Future. Currently Kay plays “Lindsey Willows,” daughter of Marg Helgenberger’s character on CSI: Crime Scene Investigation, while recent guest appearances include Medium, Ghost Whisperer, Boston Legal, Two and a Half Men, and Weeds. Last year, Kay was seen on the big screen playing best friend “George” to girl sleuth Nancy Drew in the feature film adaptation of the classic book series, and was later seen on the small screen in Lifetime’s Custody alongside Rob Morrow and James Denton. She plays the title character in Moondance Alexander, an award-winning family film that also stars Lori Loughlin and Don Johnson. She was also recognized in 2007 for her performance in the Dylan and Cole Sprouse film A Modern Twain Story: The Prince and the Pauper. KHERINGTON PAYNE (Alice, dancer) was born and raised in Orange County. As a two-year old in diapers, she couldn’t wait to begin dance lessons. Kherington also had a great love for soccer, and although it was challenging to balance both, she found a way. On top of dance and athletics, she also found time to take acting lessons and modeling jobs for Nike, McDonald’s, Limited Too, Mattel, Amy Byer, and Disney. When Kherington turned 18, she was determined to audition for So You Think You Can Dance. After being accepted onto the show, she made it as a “Top 10” contestant. COLLINS PENNIÉ (Malik, actor/rapper) was born in 1987 in Brooklyn, New York, and spent half of his childhood in numerous foster homes. Collins moved out on his own at the age of 15; he was an ordinary kid who quickly realized he wanted more out of life than what the Brooklyn projects had to offer. Collins’ undeniable talent and determination were quickly noticed, and after only six month in the business he landed his first role playing Sean on the hit daytime drama As the World Turns. Two months later Collins landed a guest-starring role as “Jimmy Gordon” on the hit show Law & Order, and then played a drug addicted thief on Without a Trace. His television work caught the attention of world-renowned Ford Model Management, who signed Collins. Soon after he was chosen to be a part of the successful “ck One” fragrance campaign for Calvin Klein. To date, Pennie has a number of films under his belt, including All Fall Down, the Oscar nominated Half Nelson, Prom Night, and Fired Up. WALTER PEREZ (Victor, musician/composer) was raised in South Gate, California, 20 miles southeast of Hollywood. He has booked several commercials and various guest star spots on prime time television shows. Most recently, Walter’s guest appearances include CSI: Miami, The Closer, and Free Radio, as well as a five-episode arc on Friday Night Lights. His feature film credits include HBO’s Walkout and August Evening, winner of the John Cassavetes award. He just completed the title role in Emilio and worked on Run For Your Life alongside Dermot Mulroney and Diane Kruger. ANNA MARIA PEREZ DE TAGLE (Joy, actress) was born in Northern California. She developed her love for theater and began training in singing, dancing and acting by starring in regional productions of Cinderalla, Bugsy Malone, and The King and I. She kept busy by modeling for several catalogs, including Macy’s and Mervyns. After begging her parents to let her try out, Anna Maria booked her 1st audition, winning her role on Disney’s hit Hannah Montana as Ashley Dewitt, a ditsy fashionista who has no idea that her nemesis, Miley, is really her favorite performer, Hannah Montana. Since hitting Los Angeles, Anna Maria has graced the small screen numerous times with roles in Bee Season, the morning show Cake, and Just Jordan, and provides the voice of the Martha, the Safety Patrol Kid, in Higglytown Heroes. She stars in the independent film A Forgotten Innocence, and was seen in Disney’s hit Camp Rock as Ella. The cast also includes instructors Debbie Allen, who was in the original film and tv show, as Principal Simms, Charles S. Dutton as Alvin Dowd, Kelsey Grammer as Joel Cranston, Megan Mullally as Fran Rowan, and Bebe Neuwirth as Lynn Kraft. 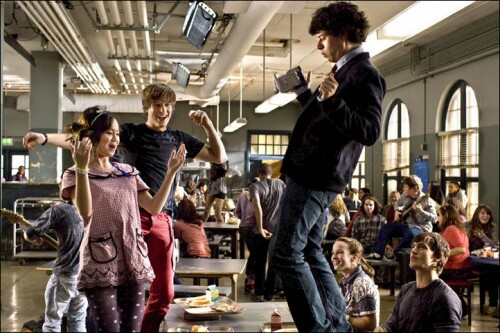 Fame is an MGM Studios film and opens in theaters nationwide on September 25, 2009.